I have a very problematic relationship with vegan baking. My lovely, vegan friend Klaudia is always missing out on dessert whenever we have a dinner party or some such, which made my sweet-toothed heart cry for her. Determined that she should want no more, I got googling and baking. But these adventures in vegan baking have been very tough on my baking self esteem. 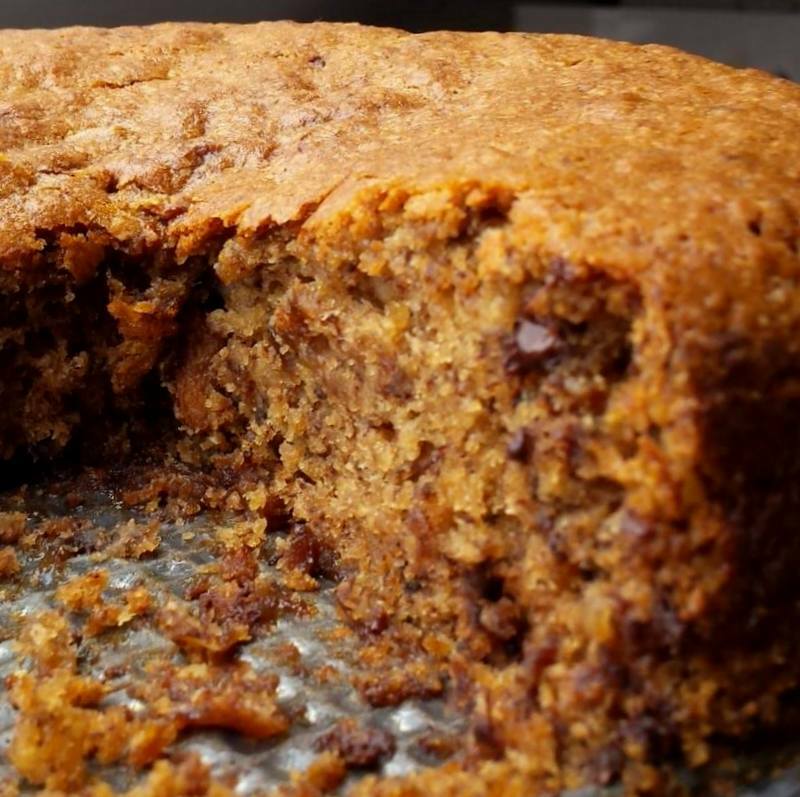 However, having wasted crazy amounts of perfectly good chocolate, and many, many bananas, I am happy to report that here is a vegan cake that doesn’t taste… well, vegan. I know a lot of people say it’s easy to bake tasty vegan cakes, but I think they must have forgotten what butter, milk and eggs taste like. I’m not a fan of margarine or soy milk, and I always try for recipes that don’t need anything ‘out of the ordinary’ to work. But in the end, I always find that, at the most, they taste ok, but lack something. Either in flavour or consistency. 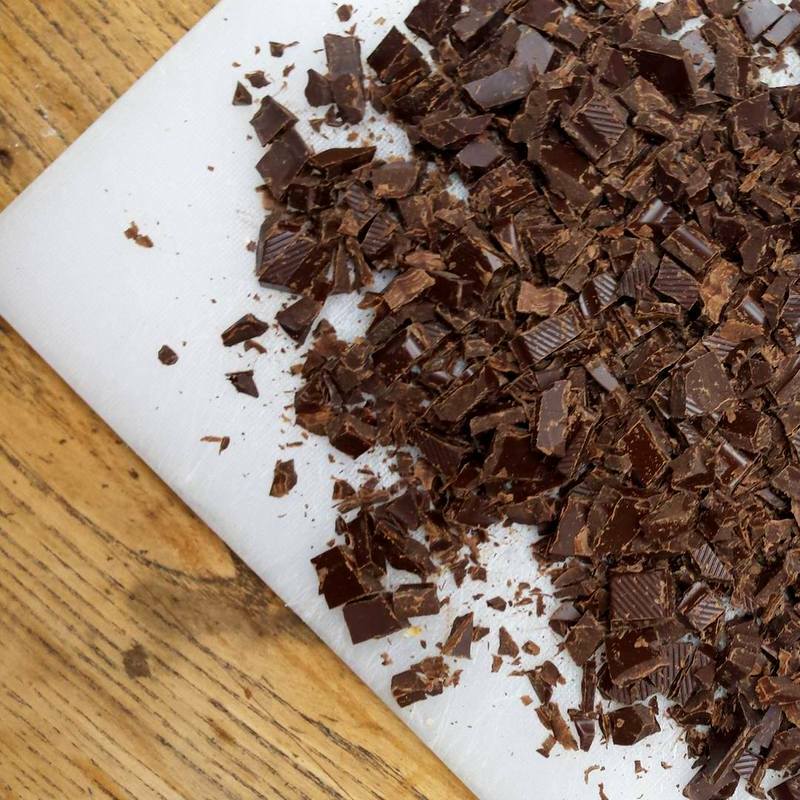 Maybe I’m mistaken, and I’ll happily be proven wrong, it’s just that I’ve tried (and failed) at so many vegan cakes now, that I’ve become very apprehensive at the idea of wasting any more chocolate. Some of these cakes have tasted fine enough.. But not in the way that you’d want to make them again. And don’t even get me started on vegan chocolate cakes… I just cannot express how many times I’ve been disappointed, when the cake that smelled so good coming out of the oven, was just… meh. So much chocolate wasted. So. Much. I’ve also tried making ganache with coconut oil, but I just find the subtle taste of coconut distracting. Anyways, do please send me your (non-fussy) vegan chocolate cake recipes, if you have any, maybe I’ve just been unlucky! Whilst more or less an omnivore, I tend to gravitate towards vegetarian food, simply because it makes me feel better after I eat it, and I feel as though I digest it better. And the way we produce and farm animal protein really disturbs and upsets me. I try to be conscious of where I buy my eggs and butter from, but even so… long story short, I’m always happy to find recipes that are vegetarian or even vegan! 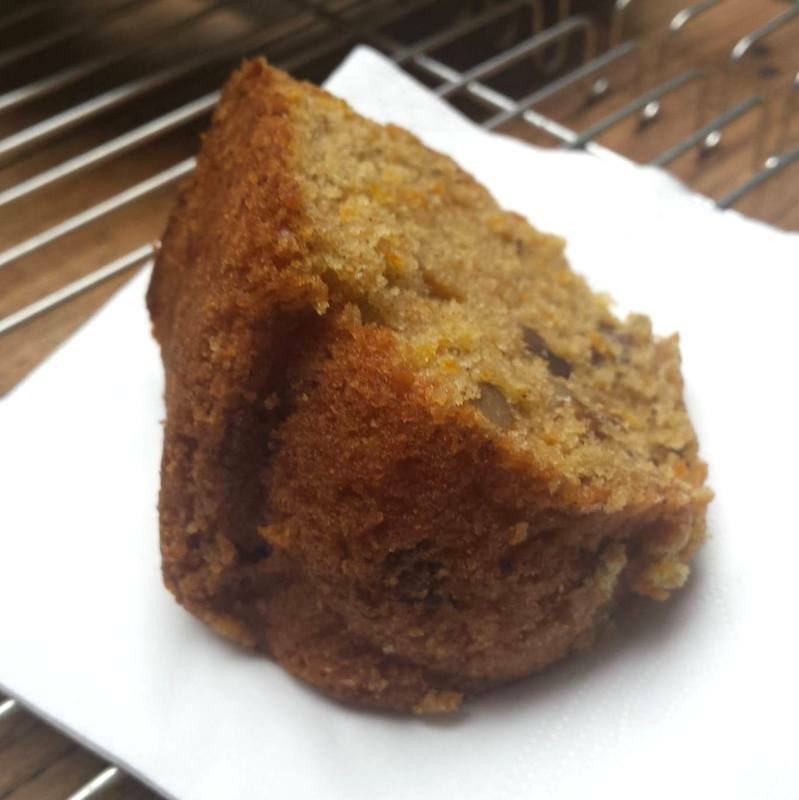 I already have a favourite (non-vegan) recipe for banana cake, but this one is, dare I say it – just about as good. And vegan to boot. 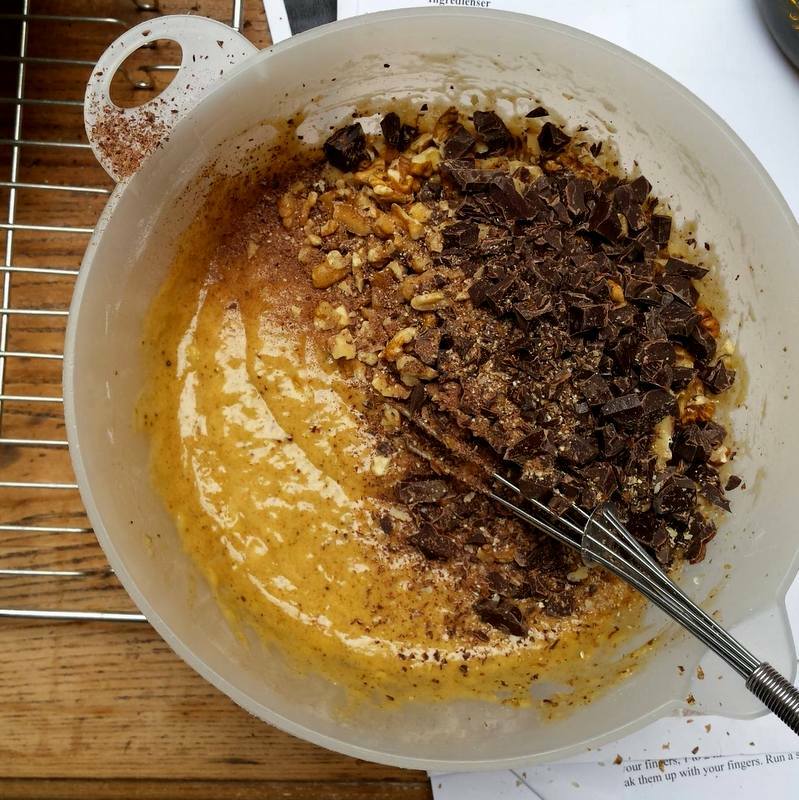 It’s from a Danish blogger, Månebarnet, which means the moon child 🙂 and it’s everything a banana cake should be, in my opinion – it’s really, really, crazily moist, studded with dark chocolate and walnuts, and strikes a perfect balance between salty and sweet. I’m really curious to try out some more of her recipes! This one turned out so yummy, and she has a lot more interesting and yummy-looking recipes.. albeit in Danish 🙂 I’m especially tempted to try out this courgette/zucchini cake. I shall report back! Whisk together all your dry ingredients in a medium bowl (flour, baking powder, baking soda, salt, cinnamon and sugar, as well as vanilla if using vanilla sugar/powder). Mush up your bananas, then chop your walnuts and chocolate. 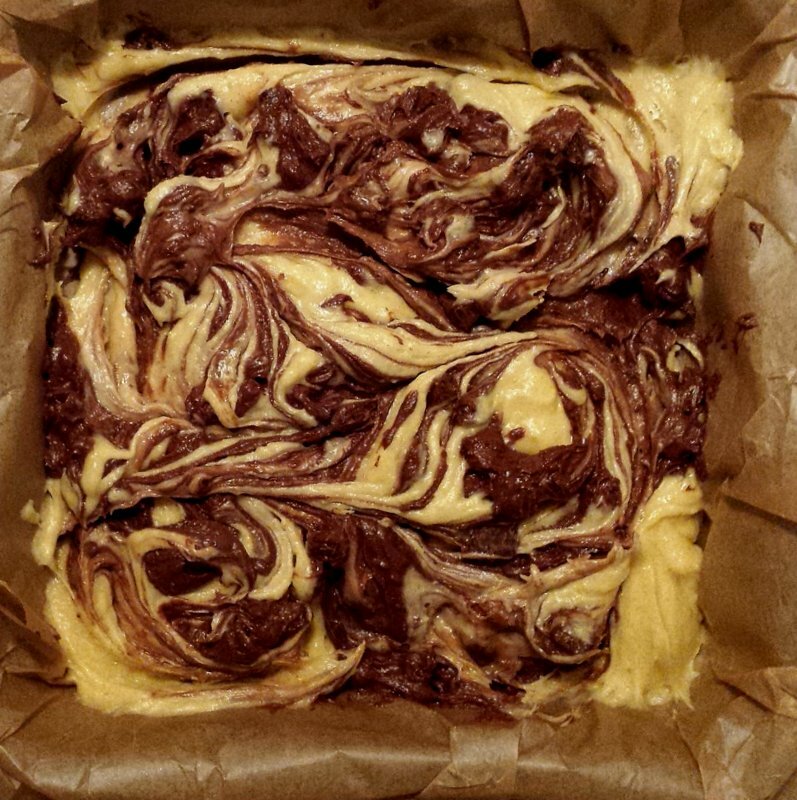 Add the lemon juice or vinegar, the oil and the mushed bananas (and the vanilla, at this stage, if using vanilla extract) into the flour mixture, and whisk until just combined (don’t over-mix, as the cake will become heavy). 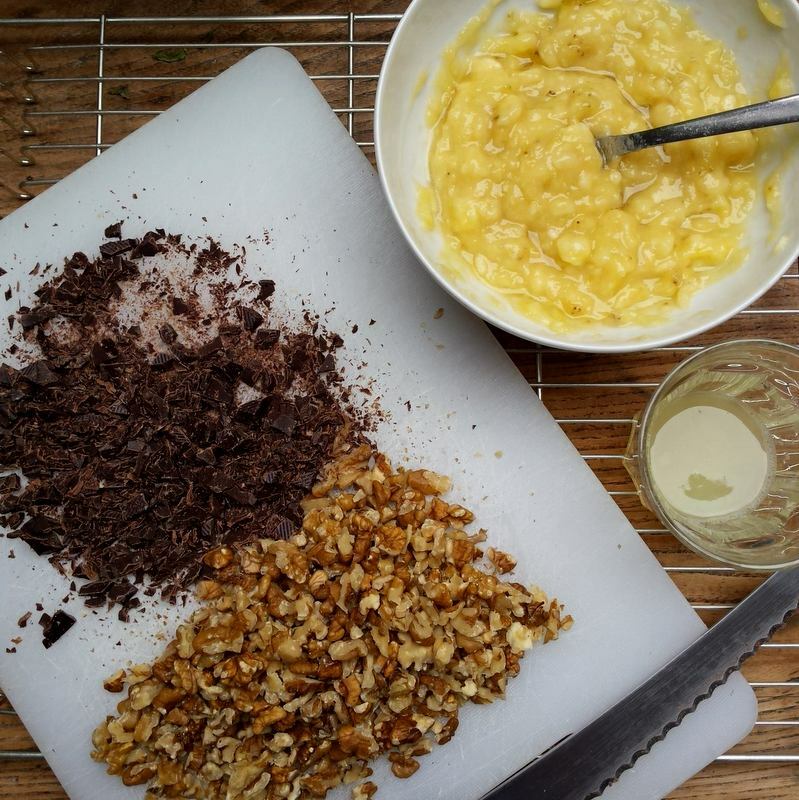 Add the chocolate chips and chopped nuts, and transfer to a greased springform tin (about 20 cm/9 inches in diameter). Bake for 45-55 minutes at 160°C/320°F, until a toothpick inserted in the middle comes out clean. Let cool before attempting to cut (although it’ll taste phenomenal, it won’t cut very neatly otherwise!). 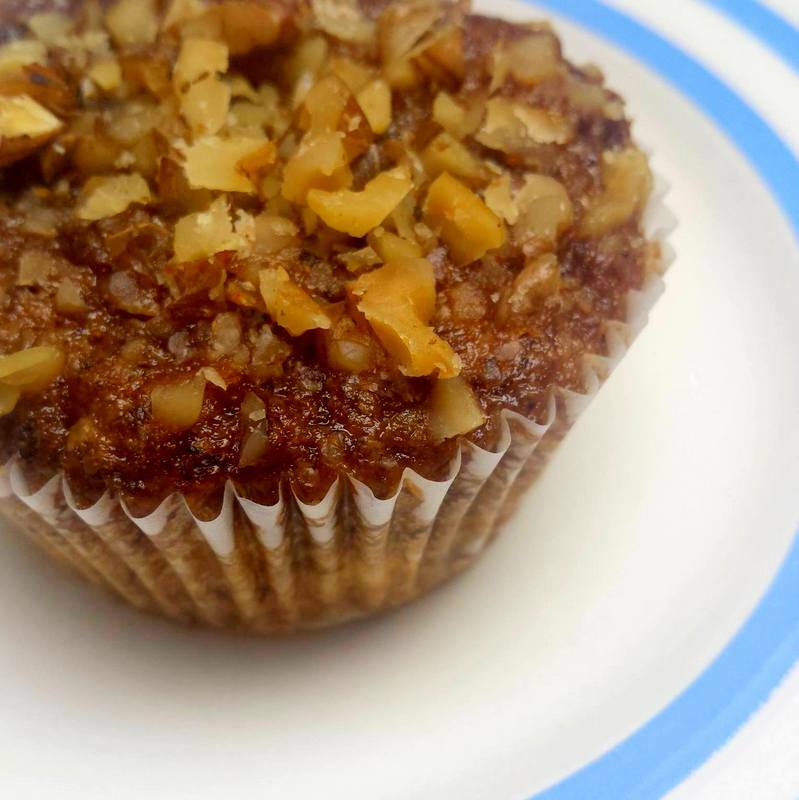 *Update: I’ve now tried making these as muffins, too, and they were wonderful! 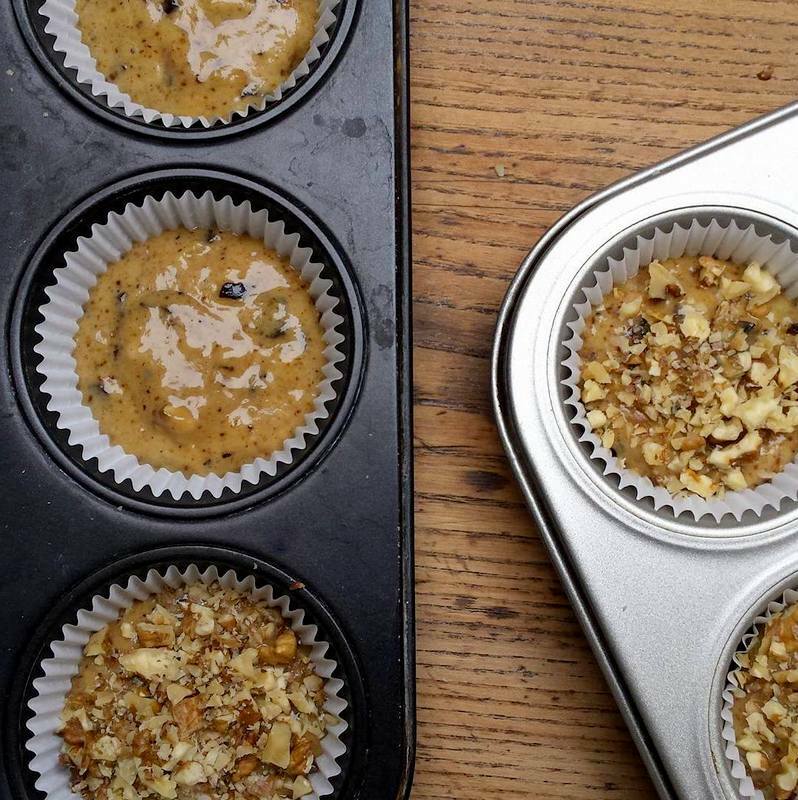 And somehow even more appealing, because they’re slightly easier to eat/transport etc, in this format 🙂 The recipe makes for about 20 little muffins. I added about 100 g finely chopped walnuts on top of the muffins, to add a nice crunch and make them a bit more appealing, visually. Bake them in muffin liners, at 160°C/320°F for 25-30 minutes, until a toothpick inserted in the middle comes out clean. This Sunday I made two different carrot cakes, 1) because I was curious to try out this recipe, and 2) because I’d grated too many carrots for the one I had initially decided to make, which was already in the oven, and so it seemed meant to be that I should bake this particular cake right this instant. Please excuse the lack of pictures – I managed to gobble up all of the cake but for one little tinfoil-wrapped piece, which I hurriedly took a picture of before eating it for breakfast a few days ago. This is different to any carrot cake I’ve tried, more a cinnamon-spice cake really, than a classic carrot cake. It’s super moist but somehow less ‘wet’ than most, containing about half the amount of grated carrots than other carrot cakes, sweet and subtle and perfectly studded with roughly chopped walnuts. It’s my favourite carrot cake to date, and that’s saying a lot, as it’s hard to go wrong with any carrot cake, in my opinion. While I don’t think any carrot cake really needs frosting to begin with (I know that this may come as a shock to most of the die-hard classic cream cheese frosting fans out there, but I am not one of them! 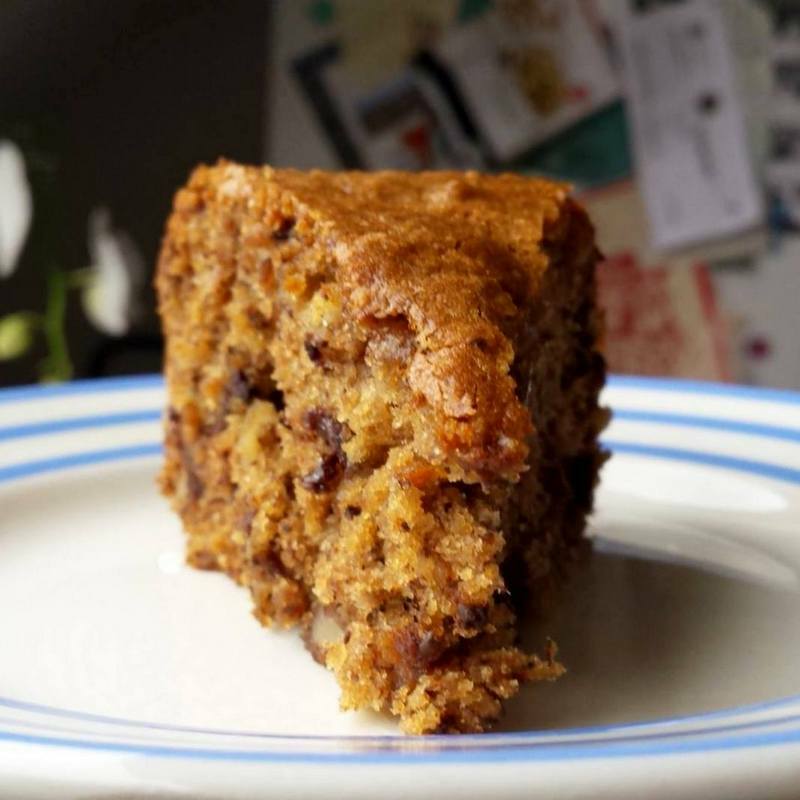 ), this cake is somehow even more unassuming than other carrot cakes, and is just perfect as is – no muss, no fuss, and no frosting. 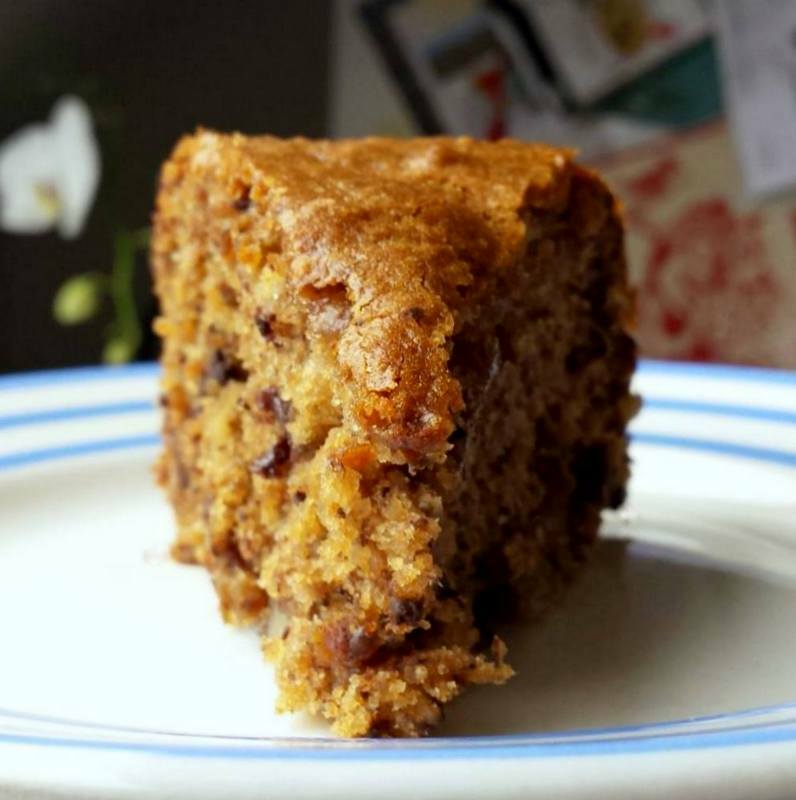 Just perfectly moist cake with cinnamon and walnuts, and a hint of grated carrot. I even ended up bringing all of the carrot cupcakes with lemon-orange frosting I’d just made to work with me the next day to give to my colleagues, although they were perfectly delicious, because I only want to eat this one right now. 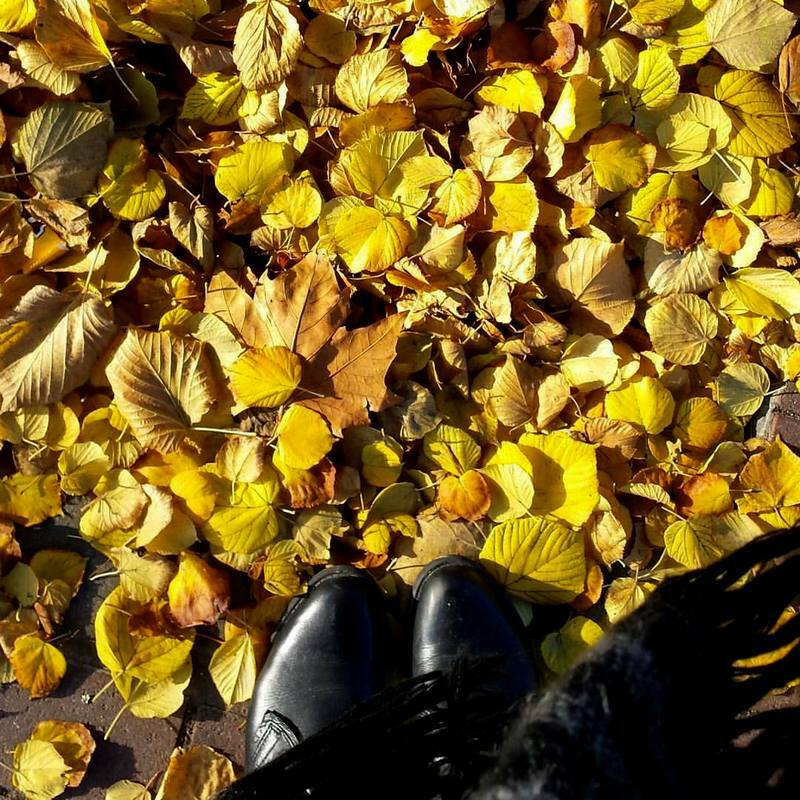 It also seems completely perfect for this time of year, red and yellow leaves on the trees and ground, and brisk autumn winds and all 🙂 the same way spiced cider and big, woolly scarves do. Long story short, I’ll certainly be making this again 🙂 and most probably not just in autumn. In a large bowl, beat the eggs and sugar together with an electric mixer, until pale and foamy. Add the oil, and mix well. Add in the grated carrots, lemon/orange zest and chopped walnuts. In a medium bowl, mix together the flour, cinnamon, baking powder and salt, then fold this into the wet ingredients. 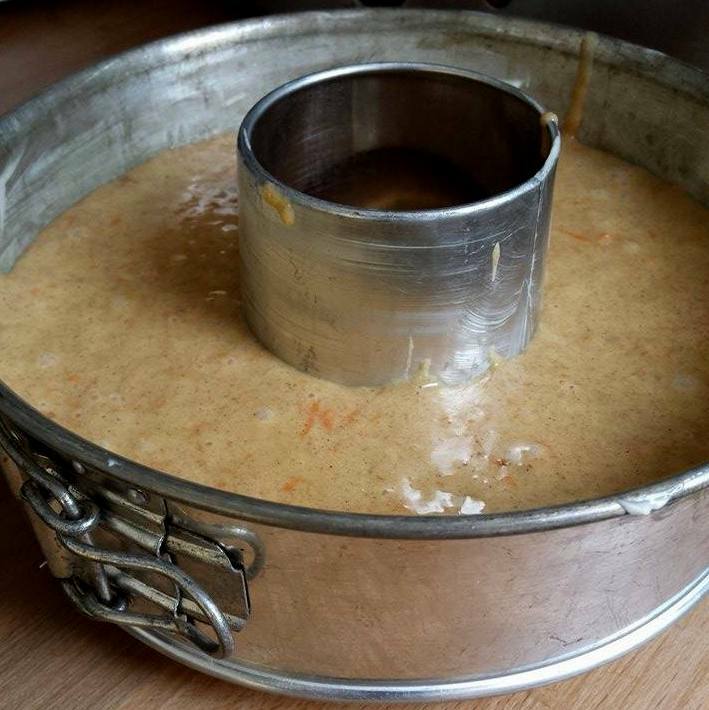 Pour the batter into a well-greased and lightly floured bundt cake tin, and bake in a preheated oven at 180°C/350°F for about 45 minutes, until the cake is golden and a tooth pick comes out clean. Keeps well for several days wrapped in tin foil. A while back, I’d planned on making a blueberry crumb cake to bring to a dinner I was going to. I was also going to make a tomato tart, and a vegan tahini and orange blossom cake. 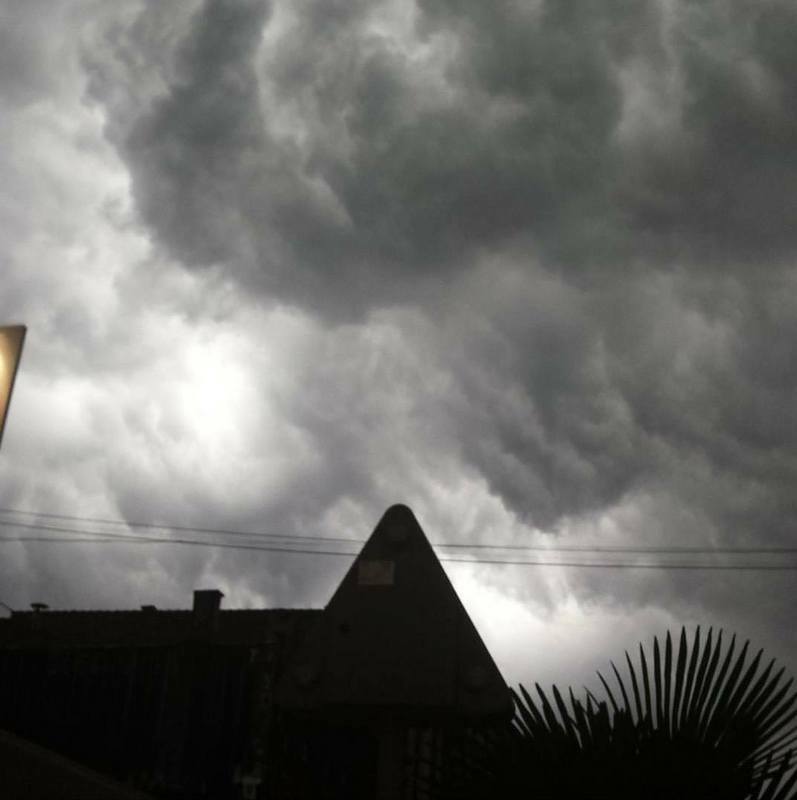 It didn’t quite work out that way, because on my way home from work, I got caught in a summer storm (told you it was a while back!) of epic proportion; it was pretty great 🙂 I love a bit of dramatic weather. I left work, and the heat and humidity hit me like a wall as soon as I left the clinically cool air conditioning of my office. Everyone was wearing shorts and skirts and mellow ‘gee it’s hot ‘ end-of-the-work-day expressions. I was sitting on the tram, lost in thoughts about the week, when the sky went almost completely black. When the tram stopped and the doors opened to let people on and off, you could feel the drop in temperature, the wind picking up, and a sort of collective sigh of relief going through the passengers, despite the sudden darkness and promise of rain. I got off at my stop, and immediately big fat raindrops began to hit the hot asphalt, so I legged it to the supermarket, trying to dodge the worst of it (unsuccessfully, but gleefully – lightning and thunder overhead, and the wind making my umbrella turn inside out). I did my shopping, drenched. And legged it on home with my groceries. But when I emptied my shopping bag, lo and behold, I’d forgotten blueberries. And the tomatoes. And also several of the ingredients for the vegan cake. It didn’t really seem all that dramatic, what with everything else in my head, so I just sort of shrugged my shoulders, and decided I’d buy a Spanish tortilla the next day, to bring to the dinner instead of the tomato tart, and, in the name of improvisation, to make the crumb cake, but to try substituting apricot jam for the blueberries (this really, really amazing apricot jam I got in Provence). But let me tell ya, it did not taste good. Way too sweet, too much lemon zest, and the jam just sort of fused itself to the crumble topping, making a sort of hard but chewy layer, rather than crispy, buttery crumbs. I must have not swirled the jam into the batter properly. But at least I learned that, were I to make it again, and this time with actual blueberries, I will definitely cut both the lemon zest and sugar quantities down a bit. Anyways, there I was, sans (edible) cake. 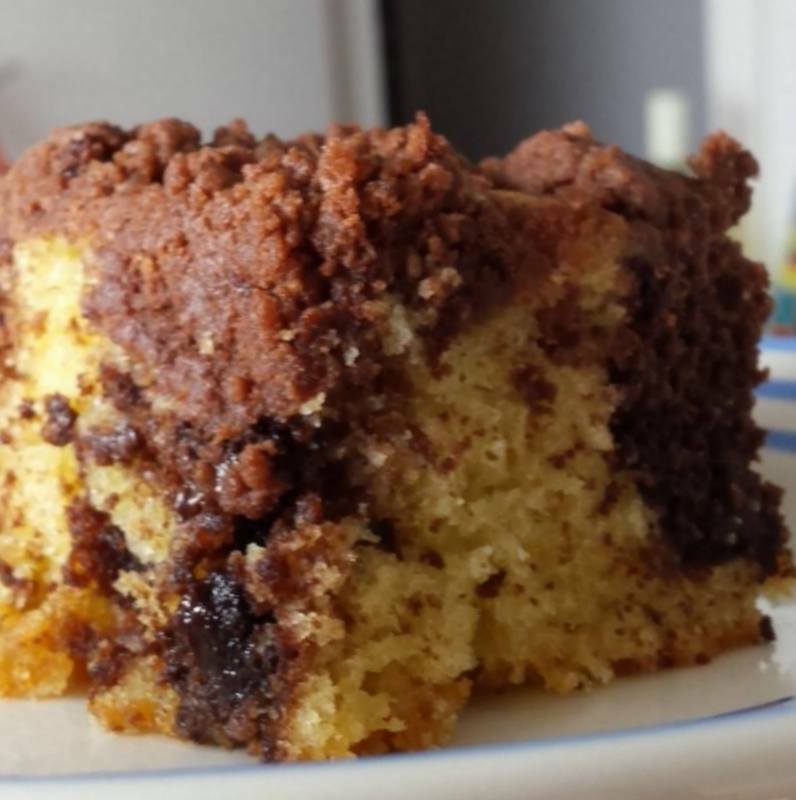 So I flipped through one of my baking books, and, since I’d had my heart set on crumb cake in particular, decided to try out this one recipe I’d been meaning to for years but somehow never got around to (and for which I happened to have all of the ingredients): a marble crumb cake – vanilla and cocoa pound cake with chocolate chips, and a thick layer of dark cocoa streusel on top. And thankfully, it was really good! Phew 🙂 And very, very moreish. I had a piece of it warm, at 11 pm, for testing purposes. And another for breakfast, still for testing purposes. Still good. And even though there were plenty of other desserts at the dinner the next day, there was barely any cake left over to bring home. Even my friend who doesn’t like chocolate cakes liked it. I think everyone likes crumble 🙂 I even made it again a couple of times over the following weeks ’cause I was craving the dark and not too sweet, intensely cocoa-ey streusel topping. So here is a super comforting, super easy, and super quick-to-make cake, one that can very easily be made the day before as it doesn’t go dry. I baked it in a square baking tin, but I think next time I might try a loaf tin! I’m really into baking things in loaf tins at the moment. Like carrot cake. And this dense chocolate loaf cake. I need to start baking some bread. But in the meantime, there’s cake. 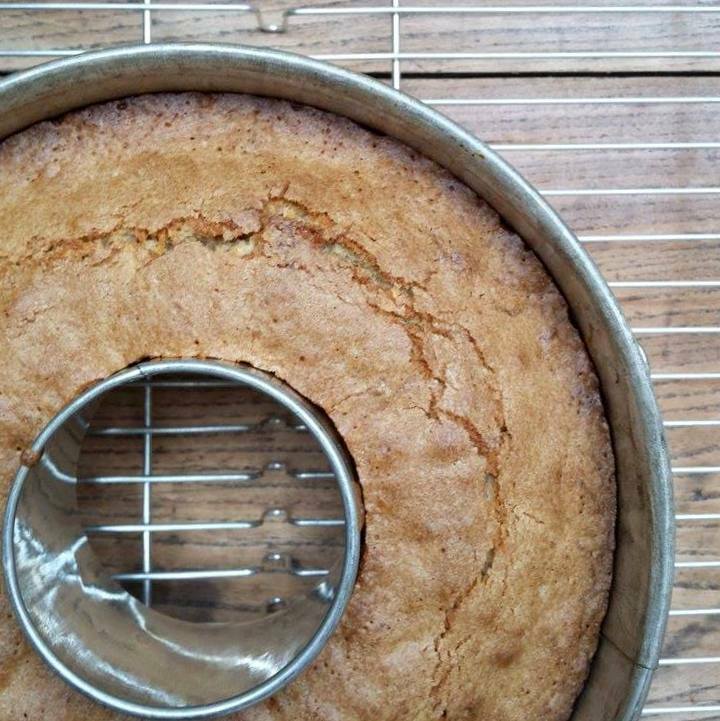 Line a cake tin (about 20 cm/9 inches) with baking parchment, and preheat your oven to 180°C/350°F. Make the crumb by mixing the flour, cocoa, sugar and salt together in a medium bowl, then rubbing the butter into it with your fingers. Add a few drops of cold water to the mixture to bring it together, leaving some bigger chunks in amidst the rubble-like crumbs, and set aside while you prepare the batter. 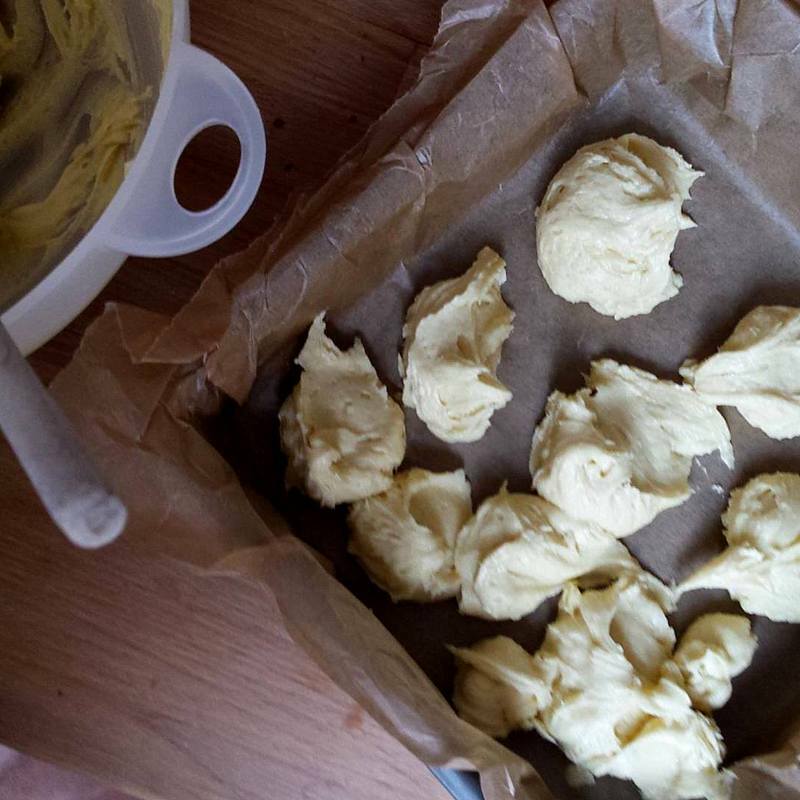 Make the batter: In a large bowl, beat together the sugar and butter till light and fluffy, then beat in the eggs one at a time, and the vanilla. In a medium bowl, mix together flour, salt and baking powder, then beat this into the butter mix. Leave to cool in the tin (but be sure to taste some as soon as possible – be careful not to burn your tongue on the buttery crumb topping). I don’t like milk, but if you do, I imagine this would be very good with a glass of cold milk. Should keep for at least a few days covered in tin foil, if you have any left over.